Image Size: 20 X 25 in. 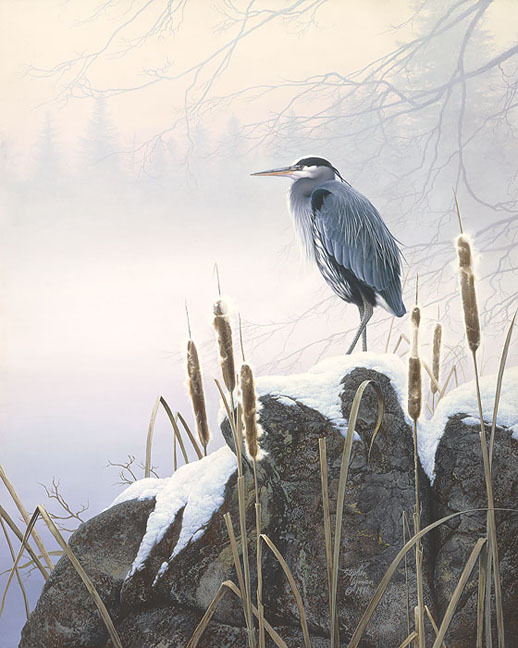 One of the most elegant of the wading birds, a Great Blue Heron, waits silently on the rocky shore of a lake in the morning mists. Although not usually seen in snow, the birds will winter anywhere the water does not freeze over and the fish are plentiful. They will stand motionless in the water until a fish swims within range of their lightning-fast beaks. This Anniversary Edition Fine Art Canvas exudes a serene quality that is almost oriental in nature making it one of Stephen Lyman’s most unique and sought-after works of art.